Nothing beats the look of custom crafted clothing. Patterns you make yourself will show off your own unique style and personality and let you stand out from the crowd. Whether your style is trendy, sophisticated, fun, casual, or businesslike, first impressions matter. That’s why it’s so important to have clothes that fit well and make a statement about who you are. If you already sew your own wardrobe, you put a lot of time and effort into making your own clothes. Don't you want to ensure the best possible result? 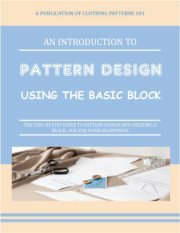 How to use a simple commercial pattern to make a basic “block” – the tool you’ll need to make perfect patterns every time. Why fit is so important and how to adjust the pattern so it fits you perfectly – you'll never do sewing alterations again! 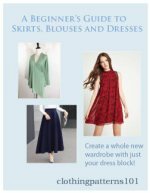 How to make sewing patterns (using your custom block) for blouses, tops, dresses, skirts - almost any garment you want, from traditional to styles to the latest fashions. The elements of design that create great style - proportion, the use of appropriate fabrics, and combining design details into exactly the style you're looking for. You don’t need the fashion industry to tell you what to wear – you know what you like! And maybe the fashion industry isn’t producing styles that are attractive and appealing to you. Why not create your own designs and start your own trends? What people see of you on the outside should reflect who you are on the inside - how often do you find that "off the rack"? Where did you get that fabulous dress? Have you changed your hair, lost weight, had “work done”? You look great! How do you do it? What’s your secret? You’ll look like you have your own personal stylist – and you do! It’s YOU! When you understand the basic elements of clothing design, proportion, and fabric selection, you can get exactly the style you want – and it will fit perfectly, too. Having spent over 20 years in the apparel and costuming fields, I can show you techniques based on those used in the apparel industry and walk you through the process from getting the fit right on your basic pattern to adding the design elements that express your personal style. Then you'll make the clothing patterns that bring your creations to life. Don’t worry, there’s not a lot of math involved! You won’t have to draft a pattern from measurements. This method is very user-friendly. You’ll use a fitting pattern (a basic bodice, sleeve, and skirt) that you can buy at your local fabric store or on Amazon.com. You’ll sew a version in muslin and adjust it to fit yourself perfectly, then copy the corrected pattern to make your own personal pattern block (a customized pattern with no style details). You can then use your block to make your own sewing patterns, adding style lines, flare, collars, pockets, and details to create whatever new styles you like. You can depend on your block to deliver every time – the fit is already built in so you won’t be wasting time adjusting sleeves, bust darts, or waistlines on every garment you make. If you spend the time and effort now to create a perfectly fitted block, you’ll save yourself time and frustration later! Your clothing patterns will fit perfectly every time. Once you’ve created your custom block, I’ll show you how to add the style details that will show the world who you are and what you’re all about. Ready to get started? Let's design your new wardrobe!